Cannes – At Cannes Lions 2018, HP pushed the limits of its technology to demonstrate the future of engagement through print, collaborating with sculptural artist Karen Chekerdjian to produce uniquely personalized and customized labels and packaging for Moët & Chandon’s MCIII champagne. Cannes Lions celebrates and awards creatives and marketing communications industry luminaries of the year. To help celebrate creativity through the power of digitally printed packaging from design to production, HP created experiences to showcase how brands and creatives can impact and evoke emotions in a personal and memorable way. During the event, HP produced personalized labels and packaging for Moët & Chandon’s MCIII - one of France’s most prestigious champagne cuvées - with the names of the daily Cannes Lions Grand Prix winners. The limited-edition packaging is an artistic printed recreation of a six-sided gold sculpture designed by Chekerdjian, whose signature was featured on each numbered box. HP collaborated with Serafi, a Barcelona, Spain-based print service provider, to demonstrate the capabilities of the latest HP Indigo printing technology, including an HP Indigo 12000 Digital Press, new HP Indigo silver ink, and HP Indigo 6900 digital press, transforming the media and items into customized luxury pieces with silver and gold metallic effects fitting the award-winning occasion. The exclusive packaging was displayed in The Girls’ Lounge in the Hotel Martinez in Cannes all week. Karen Chekerdjian is a Lebanese-Armenian designer and artist, specializing in furniture and product design. Chekerdjian’s beginnings were in advertising; she co-founded one of the first branding companies in the Middle East, but really came into her own when she decided to pursue a master’s in industrial design at Milan’s Domus Academy under the mentorship of Massimo Morozzi, cofounder of Archizoom. She worked with Morozzi at Italian furniture design company Edra before returning to Beirut, where she launched her now world-renowned design studio. From winemaking to presentation, MCIII’s packaging plays an important role. The uncommonly refined personality of MCIII, from Moët & Chandon, is a pioneering interpretation of multi-vintages champagne - an assemblage of fine vintage wines aged in stainless steel vats and oak casks combined with more mature vintage champagne aged on lees in glass bottles. 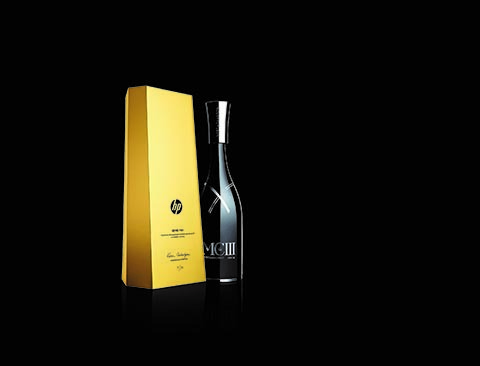 The HP X MCIII partnership is designed to celebrate the craft of creativity, honoring the finest in the business with a personalized, limited edition bottle of their ultra-prestige cuvée. At Cannes Lions this year, HP announced a new partnership with The Female Quotient, beginning with their signature event at The Girls' Lounge, which served as a destination for attendees to connect, collaborate and activate change together. In partnership with some of the world's leading brands, founder Shelley Zalis and her team at The Female Quotient create memorable pop-up experiences and impactful programming to advance gender equality in the workplace.